About 200-250 species in the temperate regions of the Northern Hemisphere. In the FSU about 60-70 species, depending on classification. They occur in various regions but mainly in the Caucasus, Central Asia, the Altay, also in the Transbaikal area and the Far East. Some of the Russian species are well-known garden plants, some have been involved in hybridization. The native irises are of great interest today. Plants increase the number of their flowers under cultivation. Central Asia (Tien Shan). In foothills, on grassy and stony slopes. Rhizomatous plant 40-50 cm. Leaves as tall as stem, sword-shaped, glaucous green, 2.5-3.0 cm broad. Flowers purple-violet, terminal, 1-3 on the main and lateral shoots. V - mid-spring to late autumn, in St. Petersburg May-October. Fl - May for 2-3 (4) weeks. Fr - August. P - by division and by seed. Does well in sunny and semi-shaded positions. Z 4. The closely related species I. imbricata Lindl. (I. sulphurea C. Koch) occurs in the southern and eastern Transcaucasus, northern Iran and northern Anatolia. Flowers sulphureus yellow, and leaves broader than in I. albertii. Prefers semi-shaded places. Siberia (southern regions), Central Asia (Dzungaro-Tarbagatay), Far East (Ussuriskiy Kray), northern China and Mongolia. Meadows, valleys, forest margins, along streams in the alpine zone. Rhizome thick, branched. Plant to 20-30 cm. Leaves falcate, 3-5, in rosette, as tall as stem. Flowering stem bears 2-4 leaves and 2 flowers. Flowers large, brown-yellow with violet veins. V - from early spring to late autumn. Fl - May. Fr - June. P - by division and by seed. Requires a semi-shaded site and moist but well-drained soil during the vegetative period. Very well suited to the rock garden, and for group planting. Z 4. (Central Asia: Pamiro-Alay) differs in yellow flowers. Grows in sunny dry places. Z 5,6. Siberia (southern regions), Far East, northeastern China, Korea and Japan. Moist meadow slopes, fluvial plains with rich lime-free soil. Rhizomatous plant 60-90 cm. Leaves sword-shaped, with prominent midrib, 1.0-1.5 cm broad. Stem shorter than leaves. Flowers 2-4, large, dark purple or violet, terminal. V - May to October. Fl - June-July. Fr - September. P - by seed and division. Known from Japan as an ancestor of the numerous cultivars of Japanese irises. Z 5 (4). Central Asia (Tien Shan, Pamiro Alay), NE Afghanistan. On dry rocky slopes. Rhizomateus plant with thin stolons 30-60 cm in height. Leaves grey green linear-sword, shorter than flowering stem. Flowers 2-3 per stem, large (7 x 10 cm), white with brown-purple veins. V - early spring. F - May-June. Fr. - August. P - by rhizome division and by seed. Requires dry soil and sunny position. Z 5. I. lactea Pall. (I. ensata auct., non Thunb., I. biglumis Vahl). Siberia (southern regions), Kazakstan, eastern Mongolia, northwestern China and Afghanistan. Steppe meadows, turf slopes. Rhizomatous plant 20-50 cm. Leaves linear, glaucous green, 20-40 cm x 0.5-2.0 cm. Flowers light blue, 4-6 cm diam. V - mid-spring to late summer. Fl - June for 2-3 weeks. Fr - August. Propagation by seed and division. Prefers sunny places, but can grow successfully in shady places. 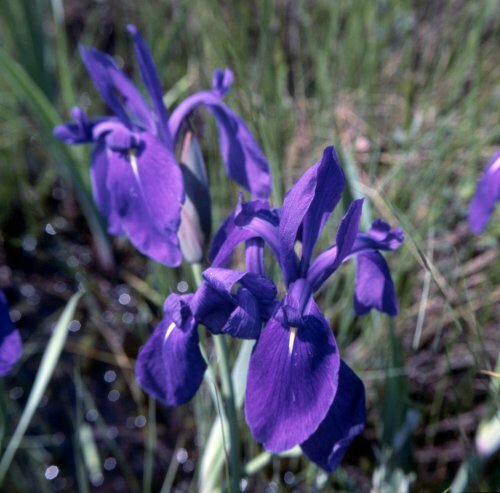 Cultivated since the XVI century, used in hybridization for selection of dwarf bearded irises. Suitable rock gardens and group planting. Z 5 (4). European parts of the FSU (southern regions), Caucasus (eastern regions), central and southern Europe. Stony slopes, steppes, on gravelly soil, solonchaks. Rhizomatous plant 10-15 cm. Leaves glaucous green, broadly linear, 10-15 cm x 1.0-2.0 cm. Flowers solitary, 5-7 cm diam, of various colours (yellow to lilac). V - mid-spring to late autumn (leaves can overwinter). Fl - late spring-early summer, in St. Petersburg May- June. Fr - August. P - by seed and division. Requires a sunny place, however can grow in a shady position. Cultivated since the XVI century and was used for selection of dwarf bearded irises. Z 5 (4). Siberia (southern regions), Central Asia (Tien Shan), northern Mongolia and northern China. Meadows, forest margins, grassy and stony slopes. Rhizomatous plant 20-30 cm. Leaves linear-lanceolate, somewhat arch-like, curved-decumbent, 40 cm x 0.4-0.6 cm. 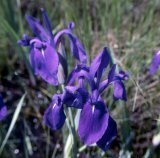 Flowers blue-violet, solitary on short peduncles (10-20 cm). V - mid spring to mid autumn, in St. Petersburg April-October. Fl -May-June for 2-3 weeks. Fr - August. P - by seed and division. For group planting and the rock garden. Does well in sunny places and in semishaded places. Z 4. I. ruthenica is close to I. uniflora Pall. ex Link growing in Siberia (Transbaykal area), the Far East (Amur River basin, Primorskiy region) and northeastern Mongolia. On steppe and stony slopes. I. uniflora differs in the shorter, thick, coriaceous, reddish leaves. Z 4. New. Siberia (eastern regions), Far East (Primorie, Kuril Islands), northeastern China and Japan. Forest margins, birch woods, dry and wet meadows, peat bogs. Rhizomatous plant 50-100 cm. Leaves sword-like, slightly glaucous, 50 cm x 2,5 cm. Upper stem leaves smaller than basal ones. Flowers blue-purple, nearly 6-7 cm long, solitary or 2-3 in a raceme. V - April-October. Fl - in June-July for 2-3 weeks. Fr - August-September. Frost-resistant, tolerates shade. Propagation by seed and division. Z 4 (3). because of its climate (excess moisture in summer, too cold in winter). Many of them occur in the Caucasus and also in Central Asia. I. acutiloba C.A Mey., western Transcaucasus, flowers 6-8 cm, grey-purple-violet. I. camillae Grossh., western Transcaucasus, flowers 6-9 cm, white-blue-brown. 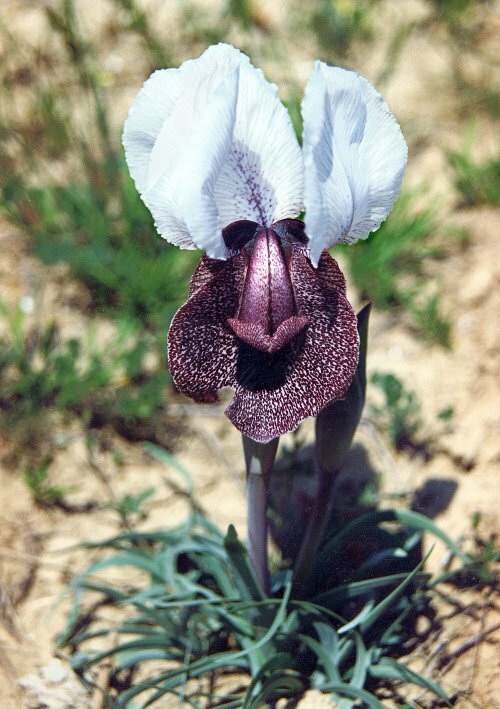 I. ewbankiana Foster, mountains of Turkmenia and northern Iran, flowers 6-9 cm, of various colours. I. grossheimii Woronow ex Grossh., southern Transcaucasus, flowers 5-8 cm, pale grey-dark brown. I. helena C. Koch (C. Koch), eastern Transcaucasus, northern Turkey and northern Iran, flowers 6-7 cm, grey brown or grey yellow. I. iberica Hoffm., central Transcaucasus, flowers 8-10 (-12) cm, white yellow-dark brown. I. lycotis Woronow, southern Transcaucasus, flowers 6-10 (18) cm, purlpe violet with blck spot. I. paradoxa Steven, southern and eastern Transcaucasus, flowers 5-8 (12) cm, pale violet-velvet black. I. schelkownikowii (Fomin) Fomin, southern and eastern Transcaucasus, flowers 8-10 cm, grey purple violet. These species produce many hybrids in the wild. They are especially abundant in two regions of the Transcaucasus: Nakhishevan and Shekinskoe nagorie.